About 80 or 90 years after its founding in 753 BC (let’s say), Rome was at war with the neighbouring city Alba Longa, 12 miles to the southeast. With their armies lined up ready to fight, a conference was held between the two leaders. They decided to try and end the war without mass bloodshed as it was thought the Etruscans would descend on the two states if they were weakened and unable to defend themselves. It was agreed that a set of triplets from each side would instead do battle to determine the victor – the Horatii (plural for the Horatius brothers) representing Rome and the Curatii for Alba Longa. During the battle two of the Horatii were killed and the three Curatii were injured. Publius Horatius turned and fled. The three Curatii brothers gave chase but at different speeds because of their injuries. 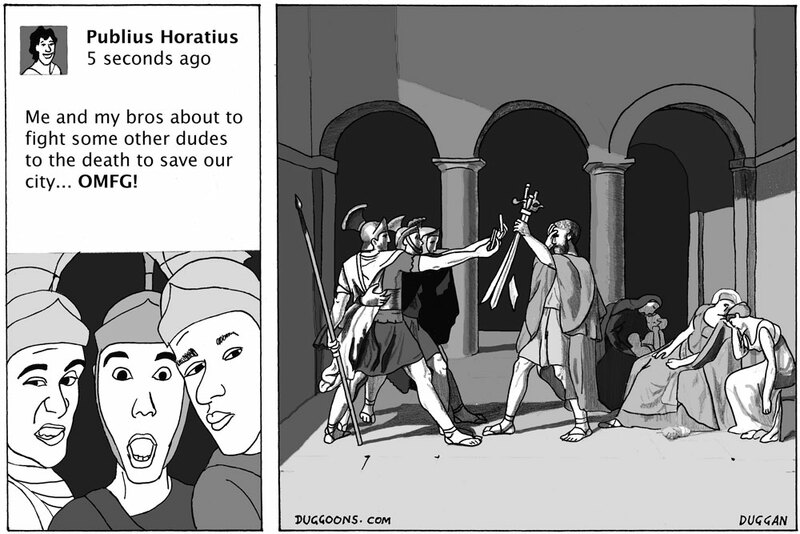 Publius Horatius then managed to pick them off one by one and thus won the day for Rome. The oath-taking in Jacques-Louis David’s painting is a highly dramatic and terrifically pictorial moment, and is entirely fabricated. None of the ancient Roman authors mention such an episode. But this is often how history gets passed down. People add little bits to the story and this is what gets believed by future generations. I’m a little suspicious about the Romans and the Alba Longans both having a set of male triplets of the same age in their midst. Unless their mothers were on similar treatments at the local IVF clinic, which, to be fair, is just as likely. I made up the bit about the selfies but in a thousand years this will be what is believed to have happened. The “Selfies of the Horatii” will be the illustration they use in the history books and the debate will be about how the ancient Romans’ savvy use of social media gave them the edge over their rivals, leading directly to the creation of one of the greatest empires in history. Maybe this isn’t far from the mark. I can’t tell you how many people have told me to get onto Twitter to expand my reach. Of course I want to conquer the world but I’m a bit old-fashioned – I much prefer swordplay. Keeps me fit.